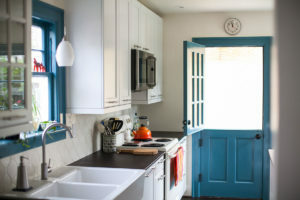 Whether you are a heat’n’serve sort of “chef” or cook everything from scratch from the production of your urban farm, a functional kitchen is essential. Size doesn’t matter — from renovating 8’x10’ low-functioning spaces into tiny and mighty power spaces to restructuring an entire floor to create an integrated living, cooking, dining space we know how to help you build the kitchen you’ve always wanted. Probably the room you use the least amount of time of all your home’s spaces, yet also takes on some of the highest impact. 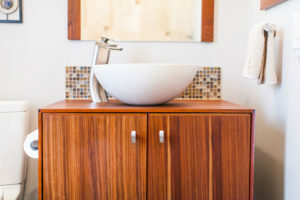 Having great storage solutions and finishes and system solutions to withstand and mitigate the intensity of moisture in your bathrooms is essential for longevity. Basements are the new black. 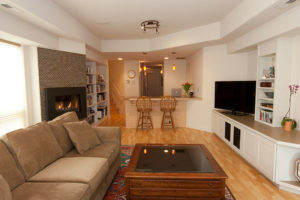 Finishing out basements into rooms to enjoy and use continues to be high on many homeowner’s lists. 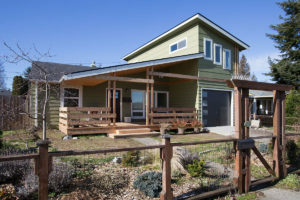 From partial- and fully-refinished spaces to rentable auxiliary dwelling units (ADUs) we can help you find new life in these underutilized spaces. If you have caught yourself saying, “I bet we have a view of Mt. Rainier from our roof,” you have likely caught the bug to add a 2nd floor to your home. Capturing views to our area’s natural beauties while adding space so many people so desperately need, 2nd floor additions can really do the trick. Sometimes the undertaking seems daunting, but with the right team of designers and builders it can be substantially less so. 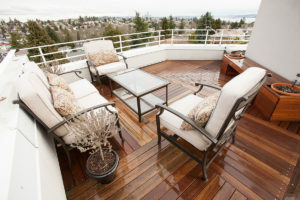 Decks are a fantastic way to maximize summer life in the NW! We build everything from backyard porches to decks large enough to celebrate life’s milestones! Sometimes the easiest way to gain “new” space is to revise how the existing space is used. 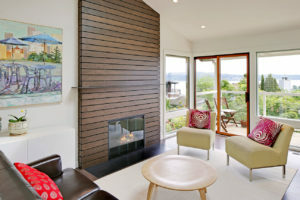 Moving walking patterns, adding built-ins, adding more space to one room by reducing the size of another, or even simply refinishing/replacing floors and giving the space a surface facelift can really revolutionize how you feel or use a room. 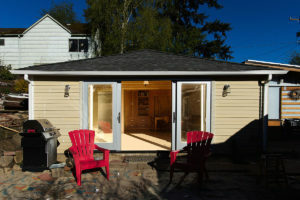 Building a backyard cottage or DADU (Detached Auxiliary Dwelling Unit) is another way of increasing the number of people temporarily or permanently living on your property. From converting underutilized garages to building ground up, we can help you realize the your expansion project. Maybe you’ve just moved into a new house and you need a smattering of miscellaneous items completed to start to feel like it is really your home. While we are really bad at scheduling projects that take less than a week, sometimes those miscellaneous items can add up to a full week (or more) of labor that we can easily fit in-between projects. Mighty House offers professional construction consulting to help turn your do-it-yourself jobs into sustainable, cost-effective projects from the ground up. With 20 years of industry experience, Mighty House can effectively translate your creative vision into an eco-friendly reality. It can be difficult to translate your dream vision into a tangible, realistic project. Our team will use their creative and practical skills to come up with innovative, sustainable solutions to shift how you live, play, and grow in your home. We’ll begin by having a short phone conversation to hear your ideas, get a sense of where you are in your process, your ideal timeline, budgetary constraints, etc. This information helps to inform whether we are the right fit for your project before scheduling time to meet in-person. Scheduling a time to meet at your home is the next step – this will give us a bit more thorough understanding of the desired project and enable us to put together a ballpark estimate to give you a general idea of the range of cost. If there is a need for an architect or designer, this is when we will make some recommendations. Our process allows for us to know as much as we possibly can about your project before we start work so that we can be as efficient and cost effective as possible! Knowing detailed parameters of the project up-front. 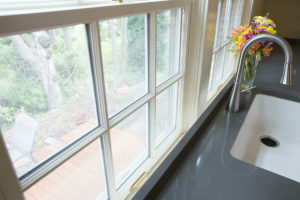 From specific structural brackets and window locations/sizes, to cabinetry style and finish, and even knob selection, having all the information before we start helps us make the right decisions the first time and reduce wasted time or materials. This is where we develop super specific pricing on your super specific ideas and selections. Before asking you to sign a contract, we will diligently to find the sweet spot between your needs, wants, budget, and maximizing a healthy indoor environment for you and your family. Utilizing your drawings and specifications we will collaborate with our suppliers and trades partners and your design team to determine a more exact price on your project; the outcome of which will be a fixed bid contractable scope of work that is unlikely to change unless you ask us to. Once we have all the details nailed down, we take our final estimate and convert into a contract with you. We will ask for deposits to hold time on our schedule and make advance purchases of some of the extended lead time materials. Here’s where your assigned field carpenter steps in with Doug and Laura’s oversight. Using our project management tool to communicate all your project’s nuances, track the schedule, keep all communications in one place, and manage decision points. Depending on the complexity of your project, we may pre-schedule regular team meetings with our homeowners and design team. Smaller projects can often be accounted for during ad-hoc meetings on the project site. Need a speaker for your community group? 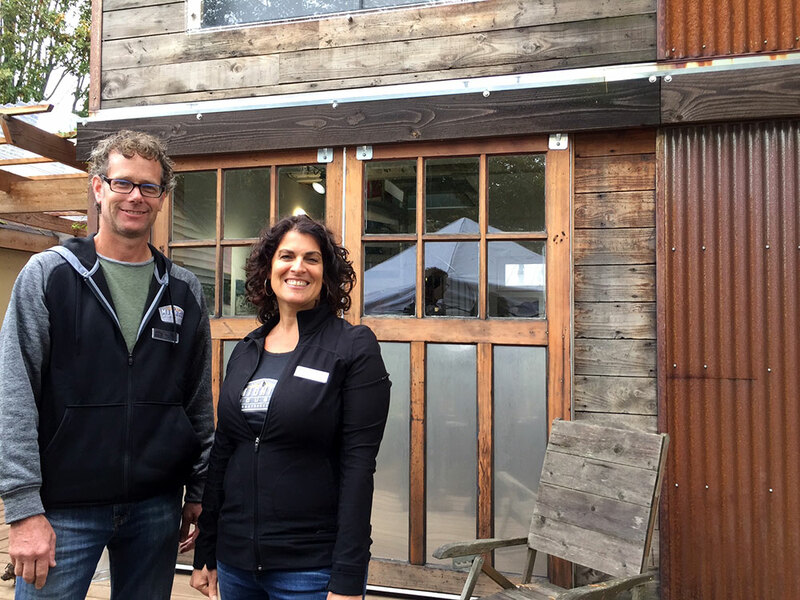 Laura delivers presentations on sustainable building and heating solutions, green living, and other related topics while Doug offers more how-to and hands-on workshops. Let us know if we can bring our expertise in sustainable building to your group.